Magento is an open-source content management system for e-commerce web sites. It is a feature-rich eCommerce platform trusted by more than 150,000 online retailers, including some of the world’s leading brands, ranging from small websites to large multinational businesses. Magento offers a level of functionality and customizability that provides merchants with the flexibility and control to create online stores. Major powerful features are catalogue-management tools, multi-store management, marketing, mobile commerce, business reports, search engine optimization and. Magento’s CMS facilities also support the creation of complex content pages, version control, and menus. 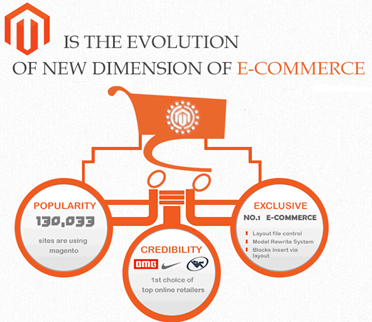 Magento was developed specifically for eCommerce. Its functionality overall is tailored towards a business structure and selling online. If your goal is to sell products, then using Magento is highly recommended. Maybe you want to support different shipping options or multiple payment methods; Just by navigating through the Magento Admin Panel, you’ll notice that an overwhelming majority of it is devoted to eCommerce capabilities like shipping options, payment integration, inventory, price management, gift cards, or order fulfilment. Magento is also more secure than using WordPress third party plugins. Magento platform comes with full of user-friendly features. Magento allows you to update your ecommerce website automatically, which is not available in other ecommerce platforms. It is simple, quick and versatile, which makes it easy for customers to search and purchase products and services through Magento powered websites. Magento offers users with highly interactive shopping experience. Besides supporting multiple website, Magento also lends support to online stores in promoting their inventory in diverse domains. Magento being designed to be a configuration based MVC system (along with a range of extensions) helps to make your website highly scalable. Magento ecommerce platform features a powerful SEO, marketing and catalogue management tools so as to fulfil exclusive business requirements of merchants. Magento is a very powerful ecommerce system. If you are thinking of starting a serious business and you can see the possibility of future growth, it’s definitely worth investing in Magento. Although every e-commerce solution has its own advantages and disadvantages, it is important to have a clear concept of your primary business needs in order to choose the right platform for your e-commerce website. You need to contemplate which one will benefit you the most; because every business has individual requirements for creating the right system. Magento is one of the most preferred platforms by businesses across all industries from start-ups, to SMEs to large enterprises.